Richard M. Coda fine-art photography: 2012: Out with the new and in with the old? 2012: Out with the new and in with the old? I'm thinking 2012 will be a breakthrough year for me, photographically. The past three years have been tough on everyone, and especially artists. Many of my photography friends have experienced reduced output and enthusiasm, myself included. The causes are multiple: disappearance of materials, reduced income, dissatisfaction with leadership, etc. 2012 brings with it an opportunity for hope and change (not that dopey hope and change from 2008). Business seems to have rebounded and things are going to change in my life this year. Our daughter, Lindsay, will be going away to college in August. As parents, Michele and I have devoted our lives to our daughter, sacrificing so she could "have better than we had". There are still four years of financial sacrifice ahead, but the amount of time that will be gained is amazing. In 2012 I hope to attempt to use some of that time to "get back into photography". I can't tell you how many times I have heard a photographer utter those words. For some reason photography is one of those avocations that is shuffled aside to take care of life. Another "back to the future" hope is to do more landscapes this year. I have mentioned several times on this blog about my yearning to do landscapes again as I have gotten older. The desert landscape is too sparse for me personally, but I hope to have the time to do some landscapes with trees and water in them. In addition, I have 30 years worth of negatives, many of which have never seen the light of day, and many of them these types of landscapes that I yearn. One project that I would like to do this year is my "Honeymoon Suite" portfolio. 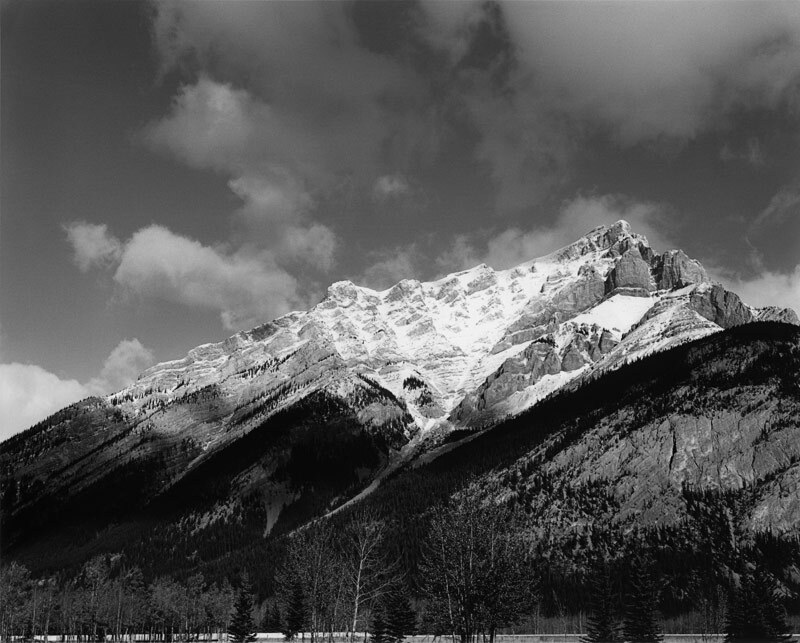 This is a portfolio of 8x10" images made from 4x5" negatives I made while on my honeymoon in 1990 in British Columbia and Alberta, Canada. I have only printed a few of the images way back in 1991, but have enough that I am going to select 10 and print a limited edition portfolio. The image above, Cascade Mountain, is one I have selected. I printed this for the first time a few days ago. It still needs some tweaks but I am excited to work on this project. Other projects I hope to start this year include several botanical series from items I have been collecting for the past couple of years; two portfolios on Phoenix (one black & white and one color) along with a book from my extensive work in the city from the past three years; and a small portfolio from my work on Ellis Island in 1984. As this is my 30th year in photography I also plan on having a 30% discount on all sales this entire year, and a special selection of vintage prints from the 1980s at fire sale prices. I will also be marketing a series of "Special Edition" prints from selected negatives for $30 plus S/H. Ansel Adams made the "special edition" print popular by offering some of his most popular images available for a very reasonable price. Today these prints are made by his last assistant, Alan Ross. My special editions will be pigmented ink prints available in only one size (7" on the long side) on 8.5x11" paper, open edition, and signed electronically. These are basically mini-posters meant to introduce my work to a broader market of beginning collectors. The purchase price of these prints can be applied toward a "Collector's Edition" photographic (darkroom) print at any point if the purchaser wishes to upgrade to a real print. So stay tuned in 2012 for all of these announcements.